Backpacking with a five year old. I decided that my son, Edward, was old enough to go on an overnight backpacking trip. 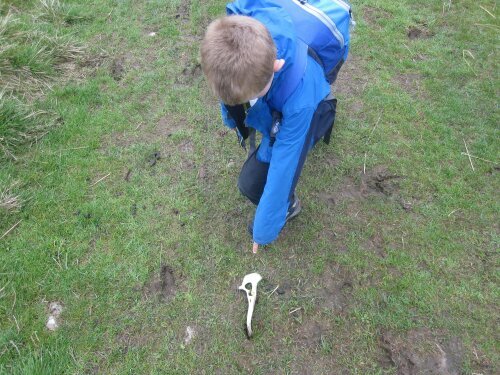 He has been on many countryside walks and loves camping. When I suggested to him we went on an adventure where we walked a long way, stayed out overnight then walked again the next day he was very keen. I wanted to make this intro to backpacking as easy as possible (for both of us) so a route with a youth hostel and short days was planned. 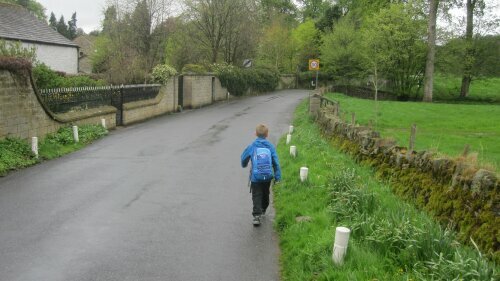 We set off early on Saturday afternoon from Gargrave train station and followed the Pennine way to Malham. A journey of about 6 or 7 miles. The forecast had said heavy rain so we dressed accordingly but we never got a drop. Fantastic! The going was easy, a bit squelchy underfoot but no worries. After all, what is more fun than squelching in mud when you’re five years old and have waterproof boots on? After about six miles Edward was getting tired and wanting to be there already. 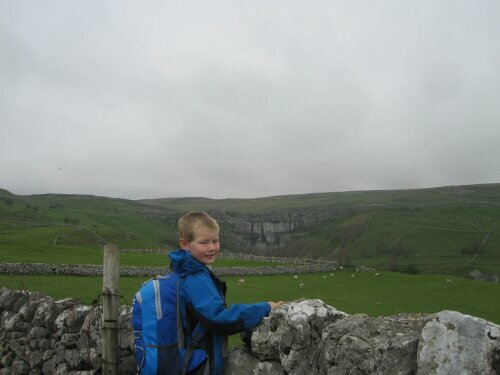 A short, steep road section didn’t improve his mood but the sight of Malham below us, a little way ahead did. The last mile flew past and soon we were checking into the hostel. When packing for the journey I’d let Edward chose the meals. Saturday night’s dinner was hotdogs. Many of them. After dinner we had a short relax in our room, a four-man dorm, also inhabited by a couple of cyclists up in the Dales for a long road race. After a lie down we went to the lounge and spent the evening reading and watching TV (You’ve been framed and the Eurovision song contest). Also in the line were five or so other hostellers, three generations of one family. The grandmother in the family spent the time sketching various views through the window. Ed and I sat reading on the sofa. Edward kept looking up at the sketching lady and grinning. He leaned in close to me and whispered loudly, “I think that lady is drawing me!” She smiled, tore out a page from her sketch book and handed it to Edward. It was a pen sketch of him sat reading. He was thrilled! They then sat and chatted about books and drawing. She even let Edward draw something in her sketch book. By ten o clock we were ready for bed, a very late night for Edward, about right for me. Sunday morning came and brought a cooked breakfast (Edward’s choice). We ate, washed up, packed and were on the way around nine am. Sunday’s route was over the tops to Settle. A slightly shorter day of around five miles but with more ascent. We followed a walled track through the fields before a short road section then up and over the hills. A few grumbles about not being allowed to eat his Mars bar (not that close to breakfast) accompanied the early climb. Chocolate soon forgotten when he found a sheep bone and insisted I photographed it. The miles flew past, Edward finding things of interest all over the place, red moss, caves, sticks, rocks and cows kept boredom at bay. Soon enough we were passing Attermire scar and dozens of fell runners racing out of Settle. Descending into Settle we made the essential purchases of an ice cream and a drink. Rewards well earned by our efforts. A few hours later and we were on the train back home our first overnight trip a success. When I get a day to myself I like to spend it either walking on the hills or mooching about town. I used to go to Leeds to fulfil my mooching needs but this time I decided to start at home and go into Bradford. 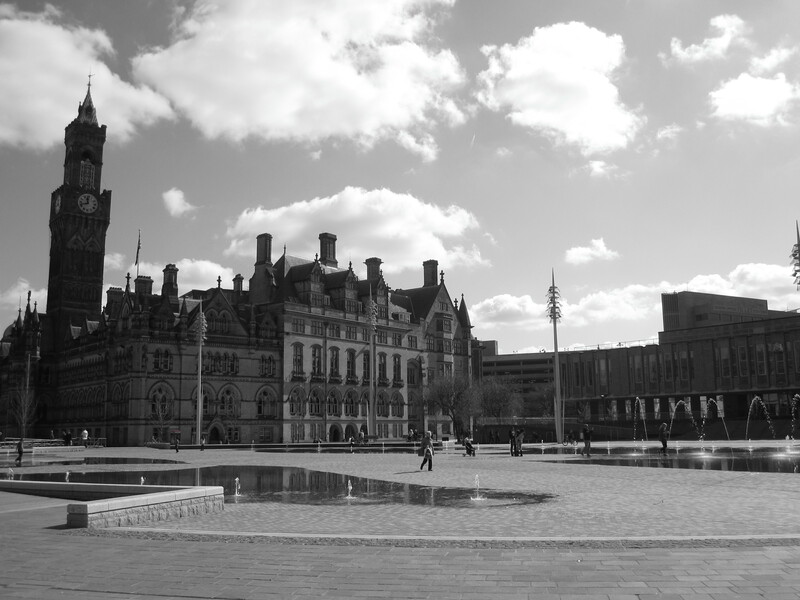 There is something of a renaissance beginning in Bradford, still in an embryonic stage but extant nonetheless. For those unfamiliar with the term ‘mooching’ -for me at least is to wander aimlessly doing as I choose. No fixed plans of activities or locations, only a vague idea such as lunch in a pub, visit a museum. That sort of thing. This easter break I have been very lucky indeed and spent two days mooching. This then is an account of things to in Bradford city centre if you’ve some free time. Life online is the first exhibition in the works to look at how the internet has shaped our lives. The gallery has examples of the humongous, slow dial up modems and the computers where it began. Video clips and text about the people who got us here. I’m reasonably knowledgeable about internet things but I found it fascinating. It is also evident that it was put together by people who ‘get’ the internet with subtle references and hat tips to rick rolling and other memes. The media museum is free to enter and one of the most popular museums in the country. To get back into the city ‘proper’ it is a short walk from the museum through the recently opened City Park with its mirror pool and urban garden. It was getting on for lunch time by this point and time to find a cafe. (though the museum does have a good quality and reasonably priced cafe itself). At the top end of town (Bradford is quite hilly!) is Northgate and my lunch destination “cafe bleu”. I hadn’t visited before but went there on a recommendation. The cafe is small and smart and has been awarded 5 stars by council inspectors. Lunch was a latte and a goat’s cheese and red onion chutney panini. (about £6) the coffee was good and the panini well filled, with melting cheese oozing out. Delicious. Even the salad was good, no limp iceberg here! A short walk from cafe bleu is the Sparrow. A ‘ bier cafe’ which opened about a year shop and had already been awarded ‘Camra pub of the season’ and got a listing in the guardian. Though Bradford had no shortage of good ‘ale pubs’ the sparrow is a little bit different and attracts write a diverse clientele. On my visit other than myself there were an older couple enjoying a light lunch of a plate of ‘morlinky’ (a cured sausage similar to kabanos) with pickles and relish (£2.20) with their pint, an English literature student who was photographing the city and assorted others on their lunch break from work in nearby offices. Despite my delicious lunch I couldn’t resist a plate of cured meats and cheese (£3) to accompany my pint(s). What I hadn’t realized from my taster glass was that the IPA I’d ordered was 6%abv. Oh well. There went the afternoon. It looks ‘trendy’ with the walls bedecked with art from local artists and the foreign beers on draught and in bottles. But it is friendly and welcoming and not at all cliquey. At any one time it has 4 real asked on traditional pumps with another 5 ‘quality beers’ on keg. None of your default John Smith’s/Tetley’s nonsense here! After my light refreshment it was back to City Park and the Bradford 1 art gallery. The gallery is housed in the Centenary Square building, also home to Lloyds and sSarbucks. It is council owned and entry is free. At the time of my visit there was an exhibition of street art including a couple of pieces by Banksy. Anyway, the contents of this particular exhibition were attractive enough, interesting in places, odd in others. I can imagine that if you do ‘get’ art then it would be more than a ten minute visit. The impressions gallery was closed for setting up a new exhibition at the time of my visit.